Some of you probably looked up at the title and thought I was completely out of my mind…well I promise you I’m not so please bare with me. I’ve been looking back at a few runway pictures and styles and something that I saw reoccurring a few times were stylish fanny packs. This caught me by surprise because I never thought a fanny pack would ever get into style. When I think of fanny pack I see a male tourist wearing sunglasses, sunscreen on his nose, a striped polo, cargo shorts that go higher on his waist than supposed to which is held by a belt, high socks, sunburned skin despite the fact he has sunscreen on his nose, and of course a fanny pack that holds his camera and perhaps even tickets to a certain place. I always told myself I would never be that person who wore a fanny pack everywhere, at least that was till I saw a few of these cute little packs that can not only compliment an outfit, but it can even enhance it! What I love about these Fanny Packs is that they don’t look like your typical fanny packs. These have cute little belts that hold the pack up instead of some ugly strap. Also the pack isn’t some odd shape that is kept in the front, these look like adorable wallets that are often put off to the side or dangling. I really wouldn’t mind wearing one of these fanny packs because they can conveniently hold things, can make an outfit look cuter, and you don’t have to worry about losing it or getting it stolen if it’s around your waist at all times. I really do hope these kind of fanny packs start coming into style and I start seeing them in stores because I will definitely jump up on this trend. The only thing I don’t like about the fanny pack is the name itself, it just sounds so weird. How about Style pack? Waist purse? I may need to work on a better name to call them. Every once in a while when the weather is nice outside and I have a craving for tacos, (there is a Mexican food truck there with yummy tacos and tortas) I will go to the flea market with my parents. My mom and dad have creative minds and love to build, refurbish, and create things, so a visit to the flea market allows them to treasure hunt, let their imagination go, and bounce ideas off each other (like the show Flea Market Flip). I have to admit I don’t get too involved when it comes to their projects, but do enjoy looking at the clothes racks and accessories. In the past I have been able to buy things, like a super cute Halloween fairy costume for $5.00, so I never know what I can find. A girl is ALWAYS hopeful. This past Sunday as my mom looked for crystal (one of her favorite things to look for), I spotted laying down on a box this awesome purse. I could not believe what my eyes were seeing! It was instant attraction! I imagined Carrie Bradshaw in one of the episodes of The Carrie Diaries strolling around Manhattan with it. And then it hit me, “No! What has my mom done to me?”. All the memories of the past summer came rolling down on me as I remembered the never ending art lectures from my mom. I realized the attraction was coming from an even deeper place. 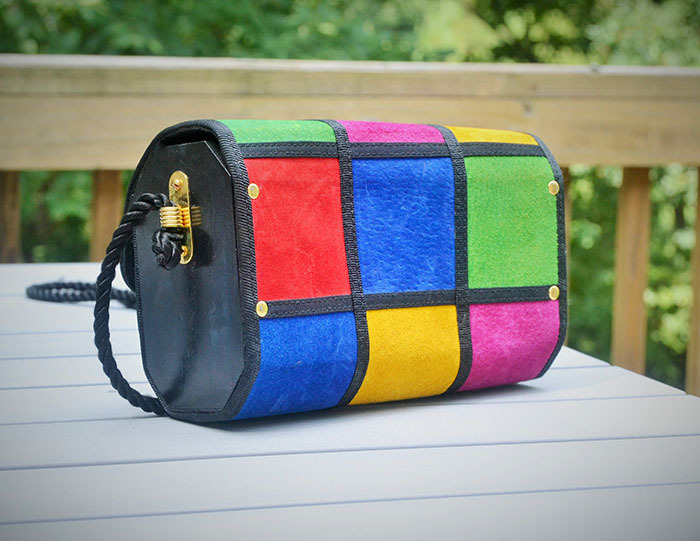 The purse reminded me of art pieces I had studied, it reminded me of Mondrian’s work. The 2013 summer of art appreciation had changed me forever!!! As I held on to the purse I let my imagination go. In a matter of minutes I thought of the purse’s story and its previous owners. I thought of the era: “the 80’s? It looks like it but I’m not sure”. I imagined the outfits that I could create with it. I imagined a really pale brunette top model in an all white background and clothing admiring the purse. The purse had finally made it to the cover of Vogue. I thought of how awesome it would be to be able to own something that nobody else would have or maybe even feel confident enough to wear. Yep! That was not me, I was certainly confident enough to wear it everywhere. Why not? And then the doubt, really are you going to wear it? Or is it too bright? I convinced myself it was probably more money than I could afford at the time for a purse that I really didn’t need it, but I decided to ask for the price anyway. 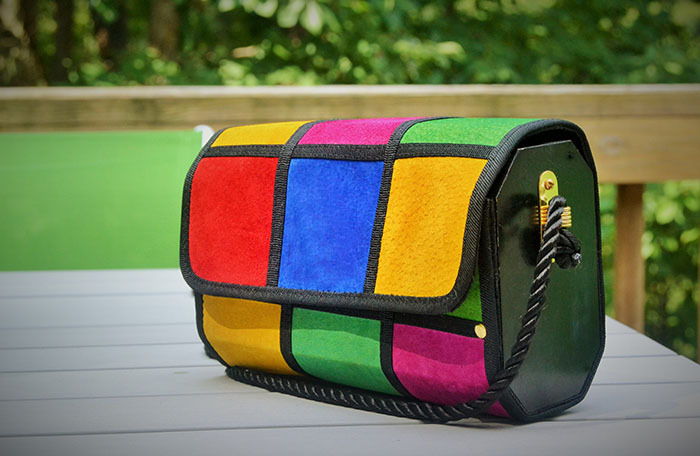 I was now way too curious to know how much value would somebody else give to a purse that had clearly been around the world and owned by celebrities and eccentrics alike (at least in my imagination). As I braced myself to hear the lady spell out the exorbitant price… she said: “3 dollars”. What??? Lady!!! You clearly don’t know what you are talking about! She probably was, but I didn’t want her to devalue my find, to devalue the connection that I now had with it. So I replied to her: “Ok, thank you”. I put the purse down and walked away. I left her booth, confident that I had done the right thing. I didn’t needed the purse anyway. All of a sudden I heard my inner voice talking to me: “You don’t like it? The price is really good for something so different!”. It was not my inner voice anymore, it was my mom. She then proceeded to give me great advice: “If you like it but don’t need it offer her $2.00, if she accepts you leave with a great bargain, if she says no you were going to leave it anyway. Win-win.” In a second she had shared a very important lesson, a lesson I will never forget, a lesson about the power of asking. You’ll never know what you can get if you don’t ask. The rest is history, the very nice lady agreed to give it to me for $2.00 and I came home with a purse to play with!